Many historical and significant people can be found by reading the street names of the Parkes Shire. Road names such as ‘Church Street’ and ‘Railway Sreet’ indicate close proximity to important town fixtures. Most residents would be aware that ‘Clarinda Street’ was named after Sir Henry Parkes’ first wife, Lady Clarinda (née Varney) in 1887. The original name of Clarinda Street was ‘Forbes Street’, highlighting that roads can be renamed. 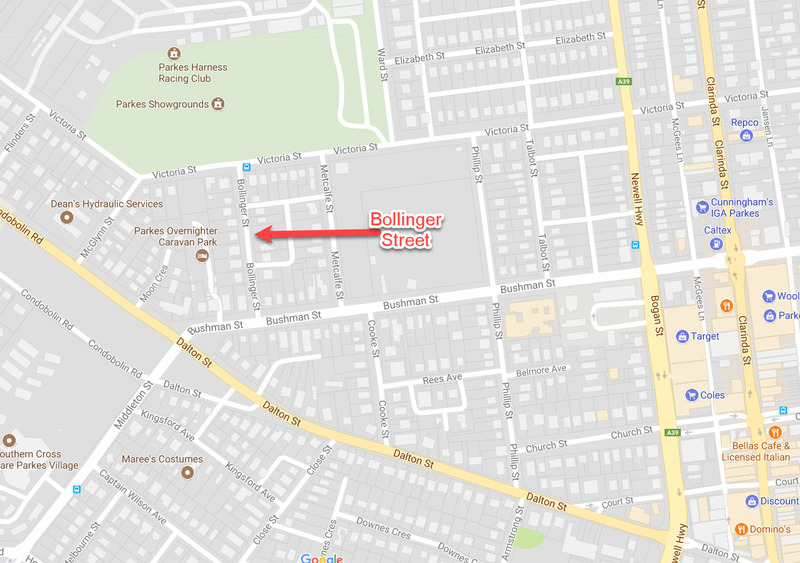 The street name parkeshistory will focus on today is Bollinger Street. Bollinger Street is a residential street, on the west side of the Newell Highway near the Parkes Showgrounds. It connects Victoria Street with Bushman Street. The street is named after the 26th Mayor of Parkes, A.G.F. Bollinger. Born Albert Godfrey Forbes Bollinger in the neighbouring town of Forbes in January 1865. His parents were Emanuel Gottfried Bollinger, a native of Switzerland who changed his middle name to Godfrey; and Anna Louisa Margarette Bollinger (nèe Schmidt). 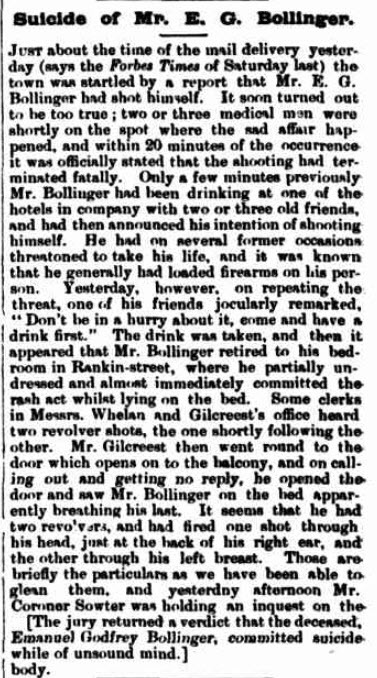 Bollinger’s mother died on December 11, 1876 – he was just 11 years old then. His father remarried one year later, to Annie Leifermann. when it was sold to John Carr. 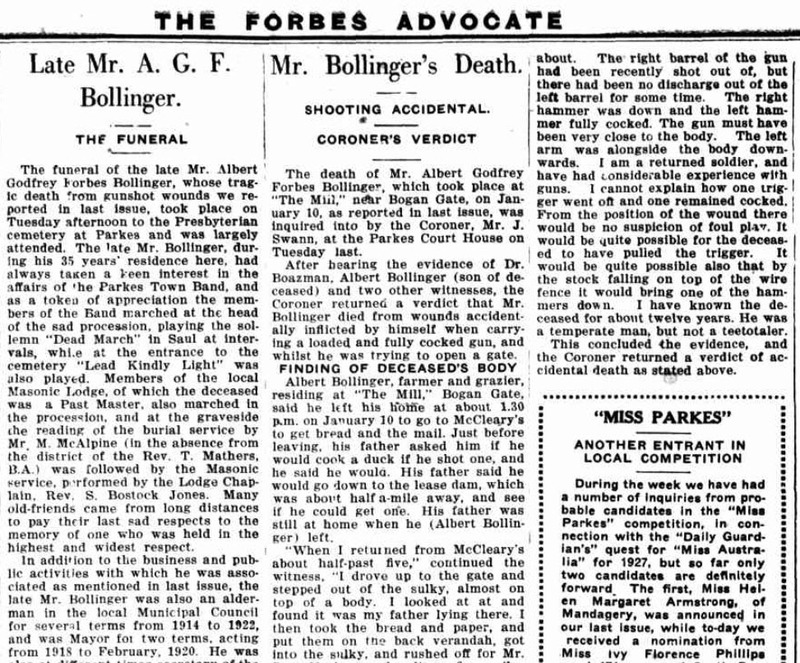 Not much is known about the details of Bollinger’s life. Despite intense research by Parkes Shire Library’s Family & Local History Library Officer, as well as former Parkes Champion Post editor Luke Merriman, no photographs of A.G.F. Bollinger have been uncovered. What little is known highlights a life lived for others, in spite of the personal tragedies he experienced. After A.G.F. Bollinger recovered from the poisoned potatoes, more misfortune was to come. 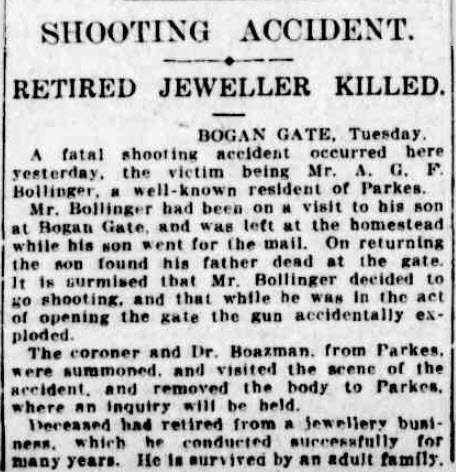 While out shooting on his son’s property, “The Mill” at Bogan Gate, Bollinger attempted to open a gate whilst holding his cocked and loaded rifle. Sadly the trigger is presumed to have come in contact with wire on the fence and resulted in Bollinger being shot fatally in the chest. His death was reported widely, including in the Sydney Morning Herald. While Merriman reports that Bollinger was buried in the Presbyterian section of the Parkes cemetery, there is no headstone. Emma, his wife, lived to 1958 and was cremated in Orange. 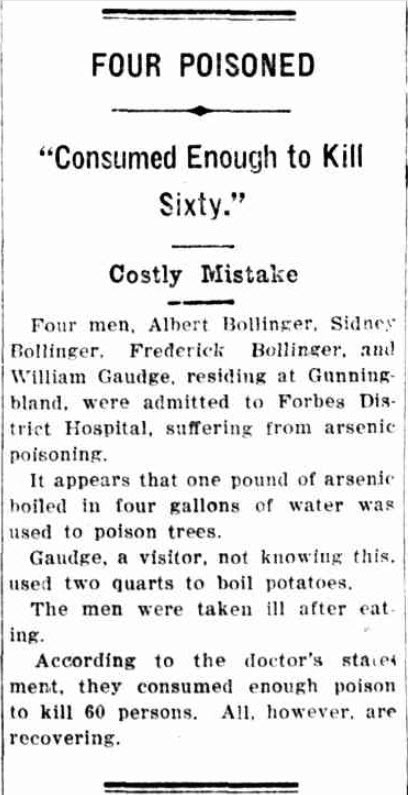 At the time of publishing this post, there were still no photographs of A.G.F. Bollinger. 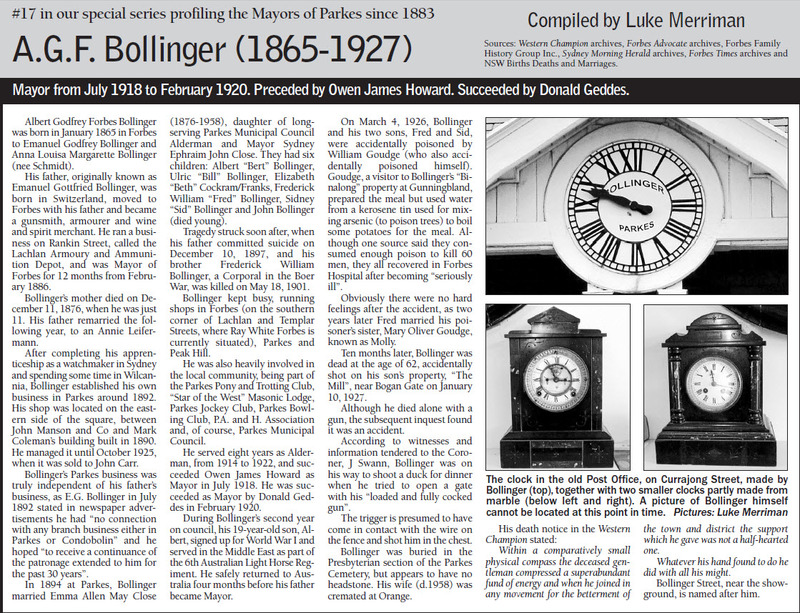 However the impact of Bollinger is not hidden within the Parkes community. 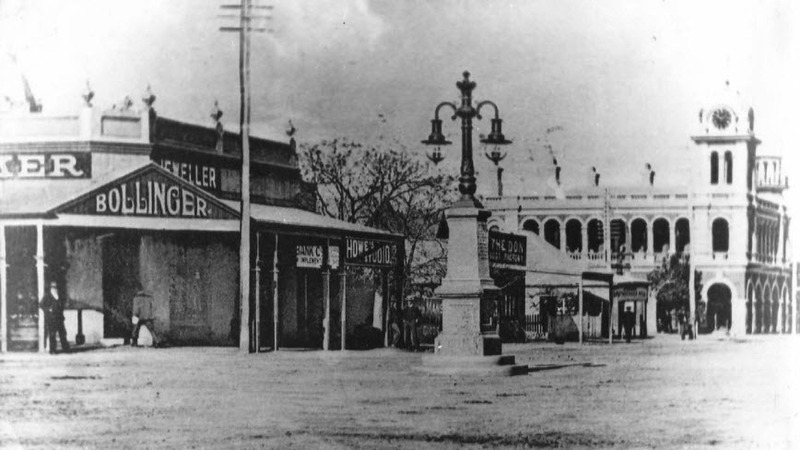 As a small business owner, Bollinger’s Jewellery store was well known. Bollinger was active on the Parkes Hospital Board, Parkes Jockey Club, a Board member of Parkes Town Band, “Star of the West” Masonic Lodge, Parkes Pony and Trotting Club, Parkes Bowling Club, the P.A. and H. Association. 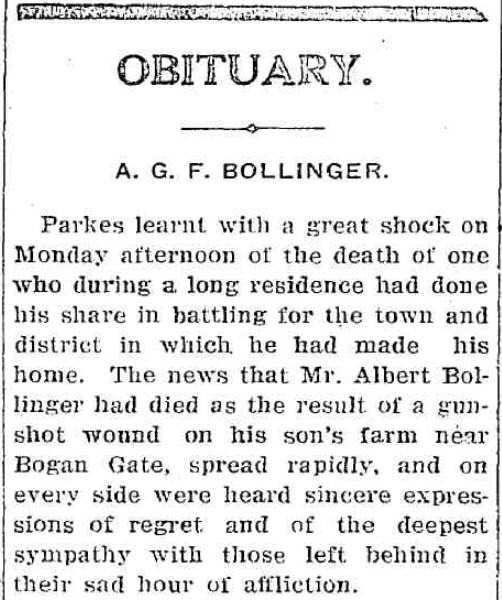 At one time, Bollinger was Secretary for the Parkes Cemetery Trustees (Western Champion Friday 3 June 1910 page 13) In addition to these numerous tasks, Bollinger was an Alderman on Parkes Municipal Council for eight years. He stepped into the role of Mayor when Owen Howard resigned suddenly due to moving away to Sydney. 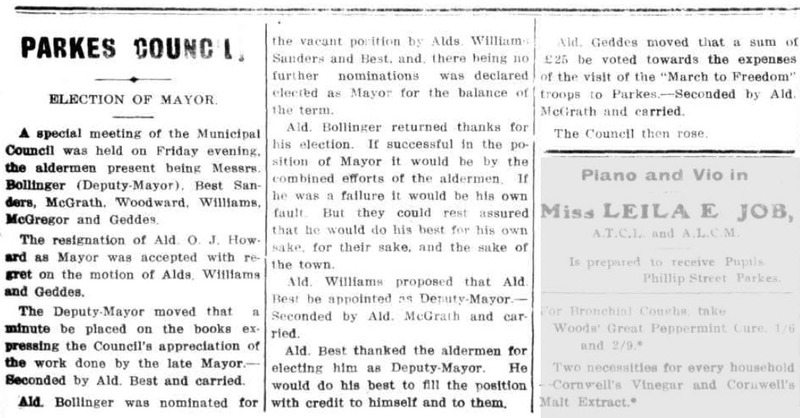 Bollinger was Mayor for nineteen months before being succeeded by Donald Geddes. Less well-known today was the fact that Bollinger was generous with gifts of trophies, medals and monetary prizes. His jewellery store included more than jewellery – with rifles and ammunition; spectacles and eye glasses (he was called an optician); fine china, crystal glassware, medals and also trophies. Like many streets within the Parkes Shire, the original name suggestion didn’t become what the street is known as. 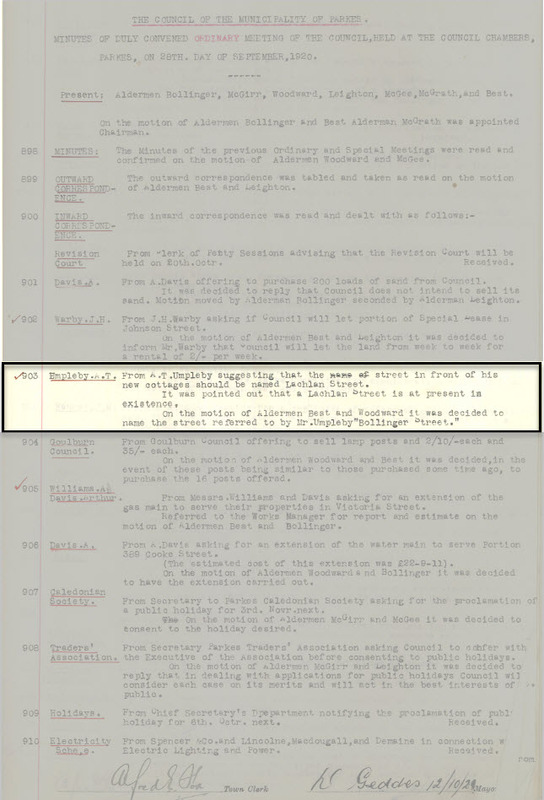 Parkes Municipal Council meeting minutes record that a Mr A.T. Umpleby originally suggested Lachlan Street for the stretch of road between Bushman Street and Victoria Street. 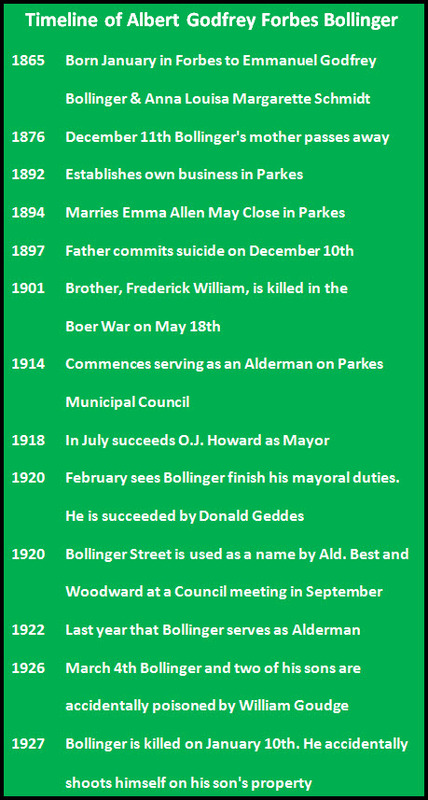 When it was pointed out that a Lachlan Street already exists, Alderman Best and Alderman Woodward put forward the motion that the name of the street become Bollinger Street. Timeline of the events in A.G.F. Bollinger’s life. If you have stories or memories that you are willing to share about AGF Bollinger and/or Bollinger Street please contact Parkes Shire Library via library@parkes.nsw.gov.au so that they can be shared and kept for posterity on this blog. Alternatively you may leave comments on this page. Merriman, L. (2011). 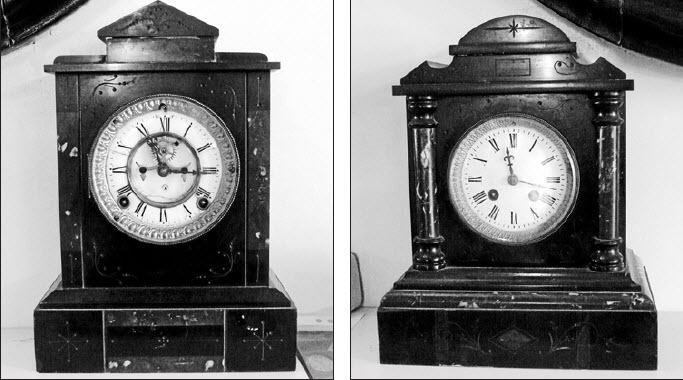 Bollinger Clock [Photograph found in Parkes Champion Post, Parkes]. In Parkes Champion Post (Monday May 23, 2011, p. 7). Parkes, NSW: Parkes Champion Post. 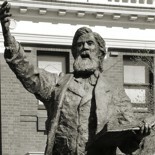 Merriman, L. (2011, May 23). A.G.F. Bollinger (1865 – 1927). 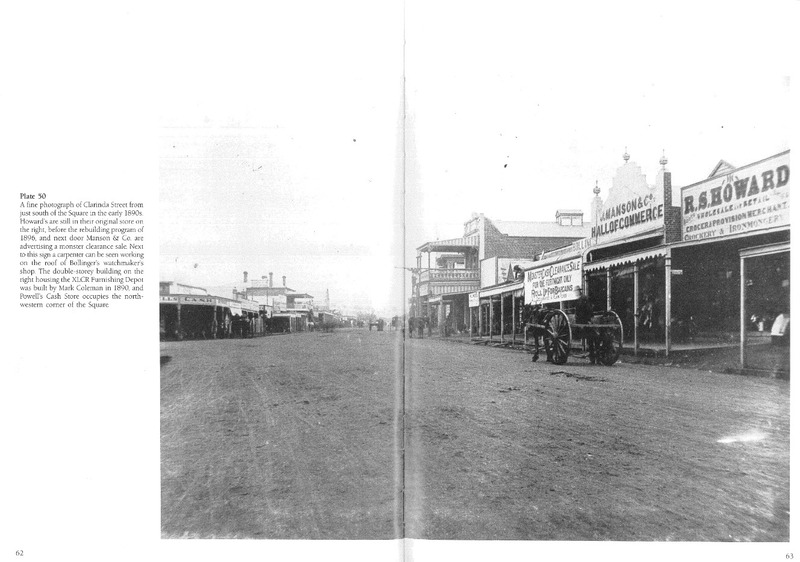 Parkes Champion Post, p. 7. Merriman, L. (2011, March 23). A G F Bollinger (1865 – 1927)[Photograph]. Mayors of Parkes, Parkes Champion Post, Parkes. A.E. Fox [Town Clerk] (n.d.). Parkes Municipal Council Meeting Minutes(Vol. 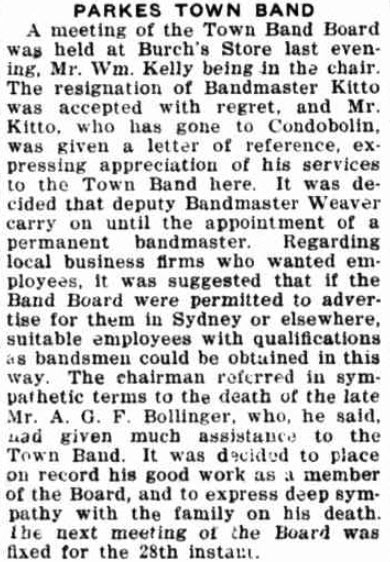 September 28th 1920) (Australia, Parkes Municipal Council). Parkes, NSW. This entry was posted on November 1, 2017 by parkeslibrary in 1890s, 1900s, 1910s, 1920s, beautification, Bogan Gate, famous people of Parkes Shire, First World War soldier from Parkes Shire, Former Mayors of Parkes, General history, Generosity of a Gentleman, Gunningbland, Legacy of Bollinger, Life of A G F Bollinger, Life of Bollinger, local historical articles, Making local news, microfilm, Parkes, Parkes Library Family & Local History Resources, Timeline of Bollinger, tragedy, Trundle, Uncategorized and tagged "Binalong", "Star of the West" Masonic Lodge, "The Mill" Bogan Gate, A G F Bollinger, accidental death, accidental poisoning, Albert Bollinger, Albert Godfrey Forbes Bollinger, Alderman, Alderman Bollinger, Alderman Moon, alderman of Parkes, Alderman Woodward, Anna Louisa Margarette Bollinger, Annie Leifermann, arsenic poisoning, Bert Bollinger, Boer War, Boer War casualty, Bogan Gate, Bogan Riverview Picnic Race Cup, Bollinger, Bollinger Cup, Bollinger Jewellers, Bollinger Street, Bushman Street, Condobolin, coroner inquest, David Nash, Donald Geddes, Dr Boazman, E G Bollinger, Emanuel Godfrey Bollinger, Empire Day sports day, Family & Local History, fatal shooting, Forbes, Forbes Advocate, Forbes Rifle Shooting Association, former editors of Parkes Champion Post, Former Mayors of Parkes, Fred Bollinger, generosity, Google Maps, Gunningbland, homemade soaps, Ian Chambers, John Carr, John Manson and Co, Lachlan and Condobolin and Western Districts Recorder, Lachlan Street, League of Wheelmen, Legacy of Albert Bollinger, Luke Merriman, Mark Coleman's, Mayor Alderman AGF Bollinger, Mayor Bollinger, Mr AT Umpleby, nee Schmidt, OJ Howard, Owen Howard, PA and H Association, Parkes Bowling Club, Parkes cemetery, Parkes Cemetery Trustees, Parkes Champion Post, Parkes Hospital Board, Parkes Hotel, Parkes Jockey Club, Parkes Municipal, Parkes Municipal Council, Parkes Municipal Council Meeting Minutes, Parkes Pony and Trotting Club, Parkes Post Office, Parkes Post Office clock, Parkes Shire Library, Parkes Show, Parkes Town Band board member, Parkes: A Photographic History, retired jeweller, suicide, Sydney Morning Herald, The Armidale Express and New England General Advertiser, The Grenfell Record and Lachlan District Advertiser, The Wyalong Advocate and Mining, The Wyalong Advocate and Mining Agricultural and Pastoral Gazette, Timeline of AGF Bollinger, Trove, Victoria Street, wedding, Western Champion, William Goudge.